Friends, I gotta be honest. I completely forgot what this book was about until I started reading it. I’m not the biggest fan of Beauty and the Beast retellings, but I have read some good ones in recent years. I was really excited to read this book, but it was just so so for me. Harper is from DC and she’s had a Rough ™life. Her mother is dying of cancer and her family cannot afford medical treatments. Her brother, Jake is forced to work for the crime lords to just scrape by. Harper also has Cerebral Palsy. Based on my own personal experiences with this disability and the story itself, its given that Harper is a little more high functioning. She was a pretty cool character, who stuck to her guns and just wanted to make sure her family was safe. She was badass and had no problem telling anyone off including the prince. Rhen is pretty much over everything and it shows. Reminded me of Rhys a bit from The Court Series. Every time a girl doesn’t fall in love with him, he turns into a different beast and no one is safe from him. Grey was my dude. Probably my fave character. Loyal to a fault, he is the only one left with Rhen and has seen what happens after every single season. He is also given the ability to travel between the worlds and kidnaps the girls for each season. The problem I always have with Beauty and the Beast retellings is someone is still kidnapped and held against their will. What made this book so interesting was that Harper was not the intended target, it was a mistake for her to be taken. And so she is already beyond apprehensive about Rhen and Grey and the whole curse. It made Harper’s relationships with both men more realistic and I appreciated it. My favorite part of this whole book was the theme of choice. Y’all know I love Bucky Barnes/The Winter Soldier and damn, Rhen and Bucky would be self-loathing best friends for sure. Rhen has been cursed by Lilith and in turn, has killed many people close to him. Harper has had to watch her mother slowly deteriorate and her brother does questionable things. But sometimes things are out of our control. Yes, there are choices we can make, but sometimes it doesn’t matter what is chosen, things still happen. Overall, I didn’t hate this and I didn’t absolutely love it either. A Curse So Dark and Lonely is a LONG book and sometimes you really felt how long. Some things were a little cliched and Lilith showing up was just annoying sometimes. The ending felt rushed and scrambled, but I saw this isn’t standalone. So maybe I’ll like the second one a little better. But while I wasn’t the biggest of fans for this book. I can see how some people would really enjoy this. This still had some cool twists and turns and was a good retelling of a beloved classic. Many years ago, Baby girl Smith was born… me! I wouldn’t meet my parents for another month, but today is my birthday! And since we are just beginning winter I thought today would be a perfect day to release my review for not only my favorite book of 2019 but also the perfect winter read. I probably talk about this trilogy at least 3 times a week, so everyone knows about my deep devotion to the first two books. So of course, the last book in this trilogy has been at the top of the most anticipated reads of 2019. I was fortunate enough to finally meet Katherine Arden this year at NYCC and man did I cry. I walked out of NYCC practically cradling The Winter of the Witch. The Winter of the Witch picks up right at the end of Girl in the Tower and the action is there. Not going to lie, I was stressed at some points. The stakes have never been higher for Vasya and we see that in this fast-paced plot. From the very first moment, you are captured by the story of it all. I said Bear and the Nightingale is a breathtaking fairy tale and Girl in the Tower is an epic adventure, but Winter of the Witch is both. All those easter eggs you were given in the first two books come together in the most creative and imaginative ways. We see where Katherine Arden wanted to take us; a wonderful journey filled with the most fantastical of characters. Katherine Arden character development is one of the greatest things I’ve ever read. Vasya is no longer the little girl who stole honeycakes from her nursemaid. Instead, she is this amazingly strong woman who has defied all expectations people had for her. Brilliantly flawed, Arden gives Vasya more character development in just a short time. I say it every day, but Vasya is my all time favorite female character. But it’s not just the main characters brilliantly written in this book. Even the most minor characters show a depth that expertly adds to this folkloric story. Just like the previous two we are introduced to more fairy tales. This installment adds many whimsical elements that are sure to entice any reader. Midnight roads, quirky characters and legends of old add an extra level of fairytale to this story that reminded me of Bear and the Nightingale. This book was everything I wanted it to be and more. I could read 100 more books about each character. BUT this is the perfect ending to a beautiful story. The characters, the setting, the story all feel completed by the end. Winter of the Witch really cemented my love for this Trilogy. You may see me hugging these books around town. This is my favorite series of all time. If you ever want my recommendation it is The Winternight Trilogy. The Bear and the Nightingale is one of my favorite books so of course, I was beyond excited to reread The Girl in the Tower. If Bear and the Nightingale is a breathtaking fairy tale, than The Girl in the Tower is an epic adventure. The Girl in the Tower picks up right where The Bear and the Nightingale ended. Vasya needs to make a choice: go to the convent or marry. But for Vasya, she chooses a third option: travel the world with Solovey. But it’s hard to travel as an unmarried female, so Vasya travels disguised as a boy. Although Vasya enjoys the freedom, she is still grieving the loss of her father. It is hard to travel alone and soon Vasya runs into people who need her help. Unable to do anything but help others in need, Vasya is once again put back into society. Vasya then crosses paths with her older brother Sasha, who had become a monk and her sister Olga, who has married a prince and has a family of her own. Meeting her siblings unexpectedly forces Vasya to keep up the disguise of being a boy. This creates some tension for Vasya and her older siblings who have also not seen her in over 10 years. Most of this story takes place in Moscow and it is very much different from the life Vasya is used to in the wilderness of Northern Russia. The kind creatures she has been so used to are powerless in the more modern world of Moscow. Vaysa has yet to find out what her disguise means for her siblings and their lives in Moscow. Betrayal is coming and Vasya will soon discover the city is not at all as it seems. Once again I found myself really connected to the story because of three things: the characters arcs, the setting and the overall themes of the story. This series has some of the best characters, I’ve ever read. While Bear and the Nightingale had Vasya growing physically, Girl in the Tower has Vasya growing emotionally. I think her growth as a character really shined in this sequel. We see Vasya struggle with her loneliness, her family and a new city. She discovers her lies and half-truths have real consequences to her, her family and for Moscow. But it’s not just Vasya, Katherine Arden is able to create a beautiful world filled with some of the most interesting characters. Not a single character is wasted in terms of development. We get more frost demon, Morozko!! With his much bigger role, Morozko was able to give us great balance to Vasya’s wildfire spirit. We learn more about him and his motives for always coming to Vasya’s aid. It’s been two months since I read this last, and I already want to read it again. The setting for this sequel has changed a little, with us being in Moscow. But it’s still just as atmospheric. You feel how old and new Moscow is to Vasya. Rich and descriptive, you will think you are actually transported into the world Katherine Arden has created. The Themes!!! Vasya is the biggest feminist, ahead of her time. She has never tried to follow social norms and her clear want for freedom is so prevalent in Girl in the Tower. This whole series is about a girl who refuses to conform to gender roles and just wants to travel. I mean what an icon. She knew traveling would be hard for a women, so she disguises herself as a boy. She risked her life to save other girls who had been kidnapped. Vasilisa Petrovna’s entire character is wrapped around this theme of gender roles and social norms. It’s what makes her a great protagonist. She’s independent, strong-willed. She’s not afraid to fail and she does fail a lot in this book. She knows the risks of being unwed, but it’s worth it to her to find her own happiness. Her step-mother acted as a foil for Vasya’s attitude towards magic and tradition. But in this sequel, it’s her sister who acts as the foil. The opposites of having a family vs wanting to be free. While Olga misses some of her freedoms, she does understand her sense of duty to her family and her role as a woman. Whereas, Vasya clearly wants to be free of the burdens of being married. I absolutely love the way Arden uniquely, creates tension between the sisters centered on this plot device. Honestly, I could talk about Vasya until I’m blue in the face. This series, this book, these characters mean everything to me. If there’s one series I wish I could reread over again for the first time, it’s this one. Do yourself some self-care and pick up this book. Come fall in love with a frost demon, a talking horse, and a girl who just wants freedom. I have loved many books in my life. I’ve loved books that tell of fantasy, friendship, and adventure, but I have never loved a book liked I love The Bear and the Nightingale. One of the most beautiful books I’ve ever read, it reached deep into my soul fall truly in love with this book. Bear and the Nightingale is on the list of books I wish I could reread over for the first time. I could talk all day about how beautiful this book is to me. Where does one begin describing their favorite book? This book is magical. The writing is lyrical, it is everything I could ever want in a book. This book is truly a centuries-old fairytale. Russian fairy tales are intertwined to make for a brand new fairytale. A story about family dynamics, gender roles in society, and faith vs tradition are wrapped up in beautiful prose. The Bear and the Nightingale tells the story of a girl named Vasya and her bravery in keeping her family safe from horrors that seem to be right out of the stories her nursemaid would tell her. Vasya has the special ability to talk with some of the magical creatures from her nursemaid, Dunya, stories. She befriends these creatures and in turn, they befriend her and teach Vasya the secrets of the magical world. Vasya’s wild and care-free nature is strained when her father takes a new bride who also can see the creatures. While both Vasya and Anna can both see the creatures, Anna considers them to be demons and treats Vasya cruelly for acknowledging them. Then an arrogant priest is sent to the village dreaming of a higher calling. But after talking to Anna about the old ways of honoring the magical creatures, he decides he is the village’s salvation. Fearing demons are everywhere, the priest uses fear and intimidation in the village. Frightened for their souls, the village slowly follows the priest’s crooked ways and turn away from past tradition. 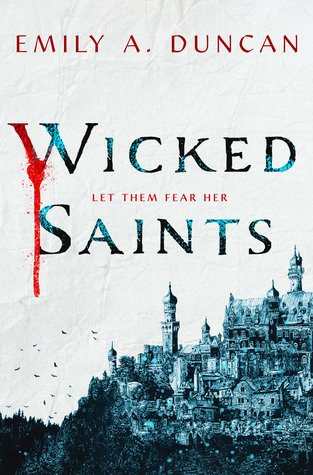 With the priest and Anna’s own cruelty, Vasya finds herself even more of an outcast. But a frost-demon has taken an interest in her wild heart. He tells her stories of the old ways and of his wicked brother. Thus begins the tale of a girl, a frost-demon, a bear and the nightingale. I love many things about The Bear and the Nightingale, but a few things really connected me to the story: the character arcs, the setting, and the deeper themes of the story. Vasya is probably one of my favorite female characters of all time. She is a very strong-willed, compassionate, care-free protagonist and it’s easy to fall in love with her. We get to see Vasya grow from a child loved by her family for her antics to a young girl who is desperate to stay free. Her need for independence is probably the compelling part of this book. The antagonists of this story are very complex because while the main villain is the Bear, the villains in Vasya’s immediate life are her stepmother and the foreign priest. The stepmother is a perfect foil for Vasya because she can also see the magical creatures but to her, these creatures are not friends but demons who need to be purged. She takes her anger out on Vasya and her cruelty towards her stepdaughter was really the true villain to Vasya’s life. I even consider the priest a villain in the way he strokes animosity and anger toward Vasya. His hatred for her masks underlining feelings he can’t define towards her. Instead of confronting his own arrogance, he blames all of his problems and the problems in the village on Vasya. Katherine Arden has absolutely stunning writing. I keep forgetting this is a debut because the visuals the reader can get is astounding. You really feel a part of the story. If you’re looking for a great wintery read or dark fantasy with great themes, and even better character arcs, The Bear and the Nightingale is for you. The audiobook is also beautiful because you actually feel like you are listening to one of Dunya’s stories. After how much I loved Shadow of the Fox, I decided to read Julie Kagawa other books. I picked The Iron Fey and I used my new library card for the first time. (Yay!) First, I was drawn to the fantasy aspect including faeries. The Iron Fey series is a little older, so of course, you also run into old YA tropes. The Iron King starts the series off with Megan Chase, a sixteen-year-old girl who is an awkward, loner at her high school. She discovers there is a world unlike her own when her brother gets kidnapped and taken to the Nevernever. She must then go to Nevernever to rescue her brother with the help of her friend, Puck. Along the way, Megan uncovers many dark secrets about Nevernever. Despite being very much a part of the old YA, this book does have a different feeling compared to most YA paranormal stories. Routed in fantasy, The Iron King gives more of an adventure fantasy novel instead of a romantic angst central plot. A Midsummer Night’s Dream has great references in this book and it really gave this book a unique feel. Yes, there was still a love triangle with a best friend and clearly a bad boy, but it wasn’t that bad for me. I really think Julie’s best writing style is her use of making fun and interesting secondary characters. In their own way, Puck and Grimalkin were exactly what was needed to move the plot along. Puck’s comic relief, this sarcastic character was exactly like Puck from Midsummer Night’s Dream. While Grimalkin was very much like the Cheshire Cat, who only provided help when it suited him. Charismatic and fun, these characters along with fast-paced fantasy makes for an exciting story. The Iron King was a cool series started for what could be an interesting series. This was a very easy read and I was able to finish in just a couple hours. 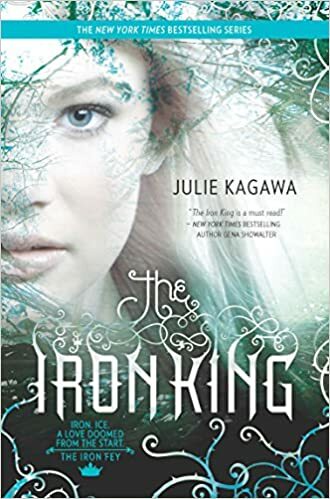 With Great illusions to a great Shakespearean play, charismatic characters, and pretty interesting villains, The Iron King set itself apart from other YA fantasy from the 2000s. Now onto The Iron Daughter.